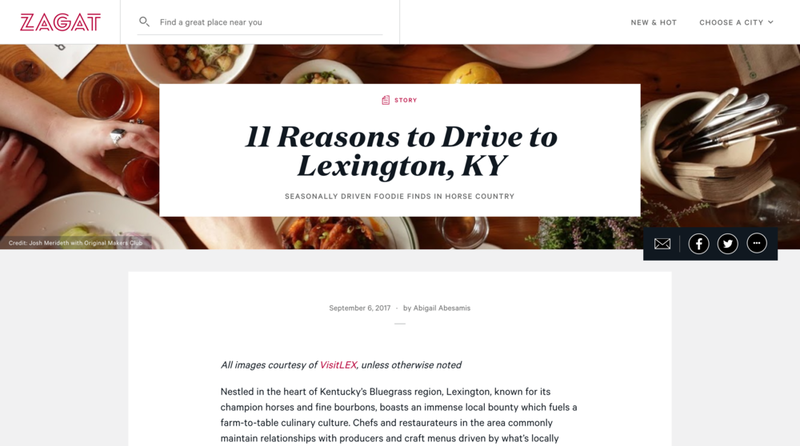 Nestled in the heart of Kentucky’s Bluegrass region, Lexington, known for its champion horses and fine bourbons, boasts an immense local bounty which fuels a farm-to-table culinary culture. Chefs and restaurateurs in the area commonly maintain relationships with producers and craft menus driven by what’s locally available. A day’s drive (or less) from many major American cities, we present a taste of Lexington’s dining scene to provide inspiration for your next culinary road trip, from a tiny bakery selling doughnuts that people still wait in lines for (even after 85+ years) to a bar with more than 600 bourbons. A creative, seasonally-driven New American menu crafted by Four Seasons alum and Kentucky native Mark Richardson meets traditional Southern hospitality at this Downtown staple located across from the bustling farmers market. Warm touches like complimentary bread service, perennial menu items (including Richardson’s Kentucky burgoo: a deconstructed, elevated version of a spicy regional stew) and a rooftop garden distinguish Dudley’s as a local go-to for special occasions. This stylish eatery is the newest and largest restaurant venture from chef and restaurateur Ouita Michel, who’s beloved by locals and nationally recognized for her commitment to supporting local agriculture. All-day menus celebrate Kentucky cuisine with creative twists, and executive chef Josh Smouse crafts evening specials informed by what’s readily available from regional farming partners. Highlights include sweet potato beignets (fluffy, savory fritters with red pepper sweet-and-sour chili sauce and scratch-made Benedictine) and beetloaf (shredded beets, carrots, sunflower seeds, sesame seeds and cheddar topped with a tomato-onion sauce). Honeywood is located at The Summit at Fritz Farm, a multi-use complex with shopping, residential areas and dining, with a locally focused food hall – the first in the state – called The Barn opening in September. You’ll find a line wrapped around the petite white storefront of this Lexington mainstay (since 1929) most days of the week, where the intoxicating smell of sugar and fried dough assuages even the longest of waits. The family-owned business began with Bowman J. Spalding and his wife selling hand-formed doughnuts out of their home. Its can’t-miss signature is a glazed yeast doughnut that’s served fresh off the glazer and practically melts in your mouth, thanks to the deliciously unhealthy amount of oil soaked into the fried dough. P.S. Cash only. Located in Bluegrass horse country amid rolling hills lined with white fences is this bustling hub for sandwiches, salads and locally crafted desserts. A Ouita Michel establishment, sandwiches feature fresh-baked bread made with local flour from Midway Bakery (also by Michel), plus a gluten-free option. Look for house creations like The Wallace Cubano (pictured above), filled with slow-cooked pulled pork with Swiss cheese, ham, Dijonnaise and Pops’ Habagardil sliced pickles and grilled with garlic annatto butter; and the Inside Out Hot Brown featuring roast turkey, ham, bacon, tomato and white Cheddar mornay. The casual counter-serve has limited indoor seating year-round and a spacious deck for outdoor dining during the warmer months, with occasional music performances on the grassy lawn. A modern Latin-inspired menu is served in a vibrant, colorful space to match at this buzzy spot on the corner of West Short and North Limestone. A recent addition to Lexington’s Downtown dining scene, look for small plates like fresh heart of palm aguachile and tamales plus street tacos featuring housemade corn tortillas. On the drinks side, there’s tequila, mezcal and margaritas – we recommend getting one with prickly pear. Be sure to save room for dessert, as the chef, Jonathan Lundy, has brought the ice cream he was known for at his former Gratz Park Inn restaurant to Corto Lima. For your bourbon fix, this unpretentious watering hole has an impressive collection of more than 600 varieties. There’s also beer on tap (including bourbon-aged local brews) and classic cocktails – we hear they make a killer old fashioned. A full-service coffee shop that turns into a nightcap bar after 11PM on Sundays and 4PM the rest of the week, this hip hangout recently made its Downtown Lexington debut. On the menu are traditional espresso drinks, cold brew and seasonal specialties like the cafe miel (local honey, cinnamon, espresso, milk) plus pies and quiches from Pig and Pepper Baking Co. During nightcap hours you’ll find coffee and tea-based cocktails like the “Horchata Undertow” (Chila 'Orchata cinnamon cream rum, double espresso, vanilla) and “Chai Toddy” (Maya chai, Bulleit Bourbon, milk, cinnamon, nutmeg). Note that during bar hours, Lussi Brown is 21+ only. This counter-serve eatery is located in a unique mixed-use development called The Bread Box, which was a bakery for over 100 years and now houses an eclectic mix of tenants including a brewery, an urban farm (FoodChain) and a roller derby practice rink. The straightforward menu of sandwiches, burgers and salads is crafted using local ingredients, some of which are sourced only a few feet away thanks to FoodChain, which provides greens and tilapia. Customers can pair their food with a beer from West Sixth Brewing, located next door, or find their brews in menu items like the fish 'n' chips platter (featuring beer-battered cod) and porter beer cheese. Guests are surrounded by art at this modern locale at the 21c Museum Hotel Lexington, a boutique hotel and contemporary art museum. A Southern-leaning menu (think sweet corn and okra hushpuppies, grits ‘al forno’ and a signature cast iron hog chop) changes according to what's available from local producers. At the bar, expect a deep selection of 60+ local bourbons and ryes (available in taste-sized pours) and a seasonally rotating cocktail menu. Named after a woman in Lexington who owned an upscale Victorian-era brothel, this self-proclaimed “bartender’s bar” specializes in handcrafted cocktails, bourbon (100+ varieties) and craft beer. Cocktails are made with fresh ingredients and rotate on a seasonal basis. Featured drinks have quirky names like Final Destination and It’s Always Sunny. Imbibers can enjoy their drinks on the rooftop bar, which boasts views of the Downtown area. Expanding upon traditional smoking techniques which utilize hardwoods and low temperatures, this intimate American kitchen highlights its responsibly raised smoked meats on a diverse menu that incorporates global flavors, from smoked chicken wings tossed in a Sichuan dry rub to a 13-hour smoked beef brisket sandwich. There are also weeknight specials, with smoked meat and vegetarian tacos on Wednesdays and smoked meat nacho trays on Sundays.